Although it has been around since NASA started using telemedicine in the 1960’s, it is relatively new as a mainstream channel for healthcare delivery in the United States. If your practice is considering rolling it out, you might run into a few things you’ve never thought of before. Luckily, we have lots of experience helping practices provide a valuable service to patients and improve the bottom line at the same time. We’ve had the opportunity to help some recover from painful mistakes. Don’t let these missteps happen to you. Applications like Skype and Facetime are terrific. They are easy to use and most people are familiar with them. They are ideal for keeping up with family and friends. They are utterly unsuitable for telemedicine. Consumer applications are not designed to protect patient confidentiality. They do not meet HIPAA’s strict requirements for data security, and even if they did, Microsoft and Apple are not going to enter into the required Business Associate Agreement with you. It is essential to choose a telehealth application that was built from the ground up with patient privacy and HIPAA compliance in mind. “If you build it, they will come,” only works in baseball movies. In real life, you have to make your patients aware of the fact that they can enjoy remote visits and how the approach can benefit them. Patients need education on what kind of visits are a good match for telemedicine, how they can schedule their visit, what they will need to do beforehand, and how they can get technical help if they need it. Posting information in your office, adding details to your website, and training staff to market the service are excellent ways to get started. There are a few reasons that having a telehealth solution that integrates with your EHR or practice management solution is important. First, automatically sending data from one system to the other decreases the opportunity for error. Next, it reduces the burden on your staff by eliminating duplicate data entry. And finally, it allows for integration with your web scheduling applications so that patients can book video visits online. 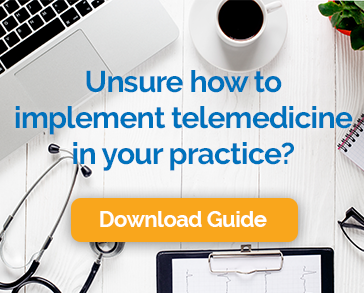 When it comes to choosing a telehealth technology and rolling out your program, the best way to avoid any potential pitfalls is to choose a partner who’s been around the block a few times. If you do, your patients (and your accountant) will have big smiles in no time.